A horizontal metal bar, the centre of which fixes to the top of a floor stand. Commonly used as a mounting bar for lanterns, in small stage lighting rigs. See also Lighting bar. The setting of a hearing aid required in order for the wearer to benefit from an induction loop. The original purpose of this setting was to activate a telephone pick-up coil in the aid, enabling the wearer to obtain a clearer sound from a telephone receiver (hence the abbreviation "T", which stands for telephone or telecoil). Originally the T setting was obtained by selecting the position marked "T" on a physical mode-setting switch, but it is now more commonly obtained by use of a button that sequentially selects the various operating modes available. Designations for the 3 and 4 pole versions of a miniature locking connector, similar in style to an XLR. This series of connectors is also known as 'Tini QG®'. 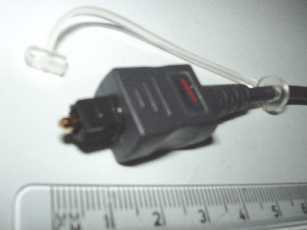 The 4-pole version is commonly used for the connection of miniature microphones (such as headset microphones) to bodypacks, with a female connector being attached to the microphone cable. The allocation of the 4 poles differs between different manufacturers of microphones and bodypacks. 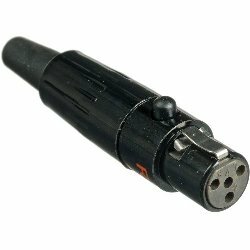 Also referred to as a 'mini-XLR' connector. The suffix F or M may be applied to the designation in order to indicate a female or male connector respectively. See also Microdot. A theatre curtain. (Usually used in the plural.) See also House tabs. A general term for any type of performer, or for a group of performers. See also Artist. A facility whereby a sound engineer located at the mixer is able to talk to personnel on stage, typically via the monitors. Some larger mixers are additionally provided with a Clearcom-compatible interface. Or, in a recording studio, a facility enabling the producer and/or recording engineer(s) to talk to the performers. Or, in a theatre or a broadcast studio, any intercom system that enables 2-way communication between technical staff, or that provides in-ear communication from technical staff to live presenters. See also Comms. A slang term for a spring line reverb unit, especially when internal to a backline amplifier. A transformer terminal which connects to a point part-way along one of the windings of the transformer, rather than to the end of one of the windings. By making a connection to the appropriate tapping, the required transformation in voltage, current or impedance may be selected. A tap located mid-way along a winding is called a 'centre tap', and a transformer having such a winding may be referred to as a 'centre-tapped transformer'. See also 100 volt line. A facility that enables a timing parameter (such as the repeat time of a delay effect) to be set by repeatedly activating a sensor − usually a switch of some kind or a small microphone built into the unit − rather than by changing the position of a physical control or the setting of a digital parameter value. Or, the process of using such a facility (as in "tap it in"). Or, a connection point for a remote tap device such as a footswitch. In analogue tape recording, the fixed equalisation that is applied, as part of the recorder/player's internal processing, to the signal(s) being recorded. An exactly opposite equalisation is applied on playback, to give an overall flat response. The main purpose of this process is to boost the level of the treble frequencies on the tape and so enable the reduction of tape hiss in the playback equalisation, so improving the signal-to-noise ratio of the played back signal. For correct reproduction on playback, it is essential that the playback machine uses (or is set to) the same equalisation standard that was used when the tape was recorded. For reel-to-reel tapes, either NAB or CCIR equalisation is normally used. The equalisation for ferric (Fe) cassette tapes is referred to as '120 µs' (micro-seconds), whilst for chromium dioxide (CrO2) cassette tapes it is '75 µs'. See also Bias (1). In analogue tape recording, the hiss that is generated on playback as a result of random aspects in the magnetisation of the tape particles. See also Noise reduction and Tape equalisation. An input on a mixer, intended for the connection of a tape deck used for playback purposes. On mixers intended for live use it is usually a single stereo input − see 2-track. On mixers intended for recording studio use, the tape returns are a set of line-level mono inputs that accept the tape (or digital recorder) playback signals during mixdown. The nature of the variation in resistance obtained as the control knob of a potentiometer (pot) (whether of the sliding or rotary type) is moved from one end of its travel to the other. When a pot is used as a signal level control, or to provide an adjustable voltage from a fixed one, the taper determines the manner in which the level, or voltage, is varied as the control is adjusted. The two other most common kinds of taper are the linear or 'B' taper, in which the percentage voltage level is directly proportional to the physical position (i.e. 50% at the mid position), and the special 'MN taper' used in dual-pot balance control circuits − see Pan law. However, other more unusual tapers are sometimes encountered, such as the anti-log 'C' taper used in some gain control circuits and the 'W' taper (log to 50%, then anti-log) used in some single-pot balance control circuits, some tone control circuits and some wide-range gain control circuits. Note: On some makes of pot, the usage of 'A' and 'B' taper identifiers is reversed, i.e. 'B' for an audio (near-logarithmic) taper and 'A' for a linear taper. An abbreviation for 'threaded cylindrical multi-pin coupling connector'. A class of connector used for multi-circuit mains supplies and other multi-circuit interconnections. See also Socapex. Compare QTBMC. An abbreviation for 'transmission control protocol', though the full term is very rarely used. This is the most common data transfer protocol used over Ethernet networks, as it provides fast and reliable data transfer. Its main use is in networks using the Internet protocol (IP), in which case the abbreviation 'TCP/IP' is commonly seen. Compare UDP. An abbreviation for 'total distortion factor', the ratio of the RMS value of the total distortion content of an alternating quantity such as an audio signal to its overall RMS value (including the contribution of the distortion). TDF may be used as a measure of the distortion introduced by a specific item of equipment, but a more usual measure in PA work is THD. Compare TDR (1). See also Intermodulation. An abbreviation for 'total distortion ratio', the ratio of the RMS value of the total distortion content of an alternating quantity such as an audio signal to the RMS value of its fundamental component. It should be made clear from the context, or explicitly, what is considered to be the fundamental component. TDR may be used as a measure of the distortion introduced by a specific item of equipment, but a more usual measure in PA work is THD. Compare TDF. See also Intermodulation. An abbreviation for 'time domain reflectometer', a specialist item of test equipment used in the location of faults in long runs of installed specified-impedance cable, most usually coaxial cable. It operates by measuring the time taken for a signal pulse, injected by the instrument at one end of the cable, to return back to the instrument after being reflected from the site of the fault. A slang term for a person who is very knowledgeable about technical things, and/or is experienced in their use. Particularly applied to computer-based equipment. Pronounced "tek-head". See also the next definition, also Guru and Soundie. Compare Technophobe. A slang term for a technician; a person who is competent in the use, installation and/or repair of technical equipment, within their own particular field(s) of knowledge. For example, a soundie, a lampie, a repair technician, etc. The term 'techie' is more prevalent in the UK, and 'tech' in the USA. Pronounced "teky" and "tek", respectively. See also the previous definition. A common signal earth connection point for all the equipment of a system (or sub-system), intended to provide a "clean" earth connection that is used only for the earthing of signal-cable screens and equipment chassis and racks that have no other galvanic connection path to earth. Its purpose is to provide a signal earthing arrangement that is uncontaminated by the mains-related earth currents and noise that are usually present on safety earth connections. Ideally, the technical earth is provided by a connection to a local earth rod that is entirely independent of the system safety-earthing arrangement. (It is sometimes referred to as a 'functional earth', though strictly that term refers to any earth connection that is used only for signal earthing purposes, i.e. has no safety-related function). To be most effective, care must be taken to ensure that the technical earth connection is not used as the safety earth for any item of mains-powered equipment, and that the technical earth is not accidentally linked to the system safety earth. This is often very difficult to achieve in pratice. (Accidental linking could, for example, occur if an item of Class II equipment, whose chassis has been connected to the technical earth, has a signal cable interconnection to an item of Class I equipment whose chassis is connected to the safety earth − assuming that the signal earth of both items of equipment is internally connected to their chassis, as is commonplace for radio-frequency screening purposes). If an alternative strategy is adopted in which the technical earth also provides safety earthing, it is essential that the technical earth arrangements meet the relevant safety requirements for a safety earth (notably, the requirements for reliability, fault current capability and a sufficiently low impedance to the general mass of the Earth). Comprehensive technical earth arrangements are usually only found in fixed installations such as studios, because of the practical difficulties of providing a separate earth rod and of ensuring that unwanted earth interconnections are not accidentally created through signal cables, equipment rack bolts, etc. N.B. Every item of Class I mains-powered equipment must have its own independent safety-earth connection to an suitable safety earth point. (Usually this is achieved through the mains power cable and mains plug of the equipment, and the mains power distribution arrangements of the system.) WARNING: Never disconnect any safety-earth connections. 'Ground' is an alternative term for 'earth', and is the more common term in the USA. See also Balanced mains. The US term for a technical earth (but is increasingly used in the UK). A specification of what is expected of a venue by a performer, band, etc., particularly (but by no means exclusively) with regard to the technical facilities required. Usually forms part of the contract between the performer and the promoter of the event, and any variations from the specified requirements must be agreed with the performer well in advance of the event date. Often abbreviated to 'rider' by technical staff. A list of the equipment (sound, lighting, musical instruments, special effects, etc.) that the performer expects the venue to provide. A list of the equipment that the performer will bring to the venue. Stage layout − location of performers, musical instruments (especially large items such as drum kits and pianos), backline, microphones, monitors, monitor mixer, etc. This information is often referred to as a stage plot. Riser requirements (size and height). Technical guidance for the venue's sound engineer and/or monitor engineer, such as channel allocations, monitor mixes, EQ settings, compressor patches and settings, etc. Technical facilities required, such as playback from mobile devices, memory stick files, CDs, Mini discs or DVDs; recording facilities; stereo or multi-channel speaker systems for special effects; etc. Mains power requirements, for on-stage equipment and/or for monitors / front-of-house PA / stage lighting. Cues for lighting changes, playing of pre-recorded tracks, triggering of special effects, etc. Crew to be provided by the venue. Set up and tear down timings. Green room facilities and refreshment/catering requirements. The general term 'rider' arises (in this context) from it imposing additional requirements that are supplementary to the basic financial and legal requirements of the contract, and which therefore could be said to 'sit on top of' those basic requirements. For some interesting (and amusing) riders of professional bands see http://www.thesmokinggun.com/backstage/. A person who has an irrational fear of technology, and/or of technical equipment. For example, a performer who is unreasonably nervous about the use of microphones, monitors, etc. Compare Tech-head. For the telephone connector, see BT431a. For the audio connector, see Jack. Usually describes a cable whose screen (otherwise known as a shield) is connected to the relevant signal earth terminal of the connector at only one end of the cable. At the other end of the cable, it is unconnected. Such cables are sometimes used in an attempt to resolve earth loop problems in balanced interconnections, although in correctly designed systems this approach should not be necessary − and should be avoided as it can be the source of other problems such as radio-frequency interference (RFI) or signal crosstalk. Furthermore, where a signal earth must be disconnected this can often be achieved by use of an earth lift switch on an item of equipment. On an unbalanced or semi-balanced interconnection the cable screen should always remain connected at the source end of the cable, to provide a return path for current flowing through the capacitance between the hot conductor and the cable screen; this current will otherwise take an unknown path and may cause problems through common impedance coupling. The term arises a) from the effectiveness of the screen gradually diminishing over the length of a cable connected in the way described above, but more graphically b) from the (very rare) use of a special type of cable having two concentric screens that are insulated from one another (i.e. a triaxial cable). In a telescoping shield arrangement using this type of cable, just the inner screen is connected to the connector's signal earth terminal at the source end, and just the outer screen is connected to the connector's signal earth terminal at the destination end. This arrangement provides better RFI performance than is obtained with a single screen disconnected at one end, because of the distributed capacitance that exists between the two screens. (The two screens are physically reminiscent of the two concentric tubes of a typical hand-held telescope.) See also Directional cable. A localised unusual temperature gradient in the lower atmosphere, in which warmer air overlays cooler air (the opposite of the normal state of affairs). Temperature inversions can impact on sound propagation in unexpected ways, such as enabling the sound from an outdoor event to be clearly heard from an unusually large distance away. See also Atmospheric conditions. The speed at which music is played, usually specified in beats per minute (BPM). See also Click and Bar (2). Describes something that relates to time. Compare Spatial. A fuse that is designed to cater for short-term currents somewhat above its rating, without rupturing ('blowing'). Also referred to as a 'slow-blow' or 'time delay' fuse. Such fuses are usually marked with a rating prefixed by 'T', for example T5A for a 5 amp rated fuse. The US spelling is 'temporized'. This type of fuse contrasts with 'normal' or 'fast' rupturing types, which are usually marked with an 'F' prefix (e.g. F5A). A common application of temporised fuses is as the mains input fuse for equipment that has a high inrush current, such as power amplifiers. A point to which the conductor of a single core of a cable (or, less often, a wire) is securely connected − usually by soldering, by compression beneath a screw or nut, or by crimping. Terminals are most often encountered inside the connectors attached to cables, but in some cases are fixed to the exterior (usually the rear) of equipment − see, for example, Binding post, Spade terminal (1), Spade terminal (2) and Barrier strip. See also Hard-wired, High resistance connection, Oxidation and Dry joint. The physical method of connection at the end of a cable (usually either a suitable connector or a barrier strip), or the process of attaching the end of a cable to its method of connection. Or, the location of the destination of a particular cable. Examples of these usages are: "I need a cable with a BNC termination", "Have you terminated that speaker cable yet?" or "Where is this cable terminated?" A cable, or a circuit (or line) within a cable, that is neither wired to a connector nor directly to any equipment is said to be 'unterminated'. A resistive load, connected at the destination end of an impedance-matched interconnection such as one carrying video, digital audio or DMX lighting control signals. Its purpose is to provide a load impedance equal to the source impedance and to the characteristic impedance of the cable, thereby reducing reflections of the signal back down the cable. An example of this usage would be: "This circuit requires a 75 ohm termination". An impedance-matched circuit that is connected to an appropriate terminating load is said to be 'terminated', whilst one lacking an appropriate termination is said to be 'unterminated'. Usually the required termination is provided by circuitry within the equipment to which the signal is supplied. A switch may be provided which enables such an internal termination to be disconnected, allowing a daisy-chained 'through' connection of the feed to further items of equipment. In such cases care must be taken to ensure that the termination is connected at only the last item in the chain. (An example of this arrangement is where several lighting fixtures are connected to a single DMX control feed.) In the absence of such a facility, a distribution amplifier must be used if an impedance-matched signal source is required to supply several destinations. See also Double termination and Return loss. Compare Open-circuit (1). An abbreviation for 'total harmonic distortion'. A brand of guitar amplifiers etc..
A thermal circuit breaker is so-named because of its internal method of operation; it is not intended to be influenced in any way by the temperature of the equipment in which it is used. (For example, the function of a mains input thermal circuit breaker on a power amplifier is entirely different to that of the amplifier's thermal protection facility.) It operates using a low-resistance internal heating element in series with its contacts; the device is arranged to trip (i.e. open its contacts) when the temperature of this element exceeds a preset value. This is very similar to the internal thermal mechanism of an MCB, however a thermal circuit breaker lacks the fast-acting magnetic mechanism that is additionally provided within an MCB. See Thermal protection, Thermal circuit breaker and Thermal fuse. A protective device, internal to an item of equipment, which operates at a preset temperature to shut down the operation of the equipment (or of part of it) and so prevent the temperature from rising to a value which would damage the equipment. Thermal fuses are non-resettable and must be replaced if their operating temperature is exceeded. They are typically arranged to operate at relatively high temperatures, e.g. to provide a back-up to an electronic thermal protection facility such as may be provided on a power amplifier. However, resettable thermal circuit breakers are sometimes incorrectly referred to as thermal fuses. The noise that is generated in a resistance by virtue of the random motion of the atoms that make up the material. It is usually heard as a hiss. The description 'thermal' arises because the extent of this motion increases with rising temperature. More properly, it is called Johnson's noise, after the person that first documented it. The RMS noise voltage generated is (4kTBR)½, where k is Boltzmann's constant (1.38 x 10−23), T is the absolute temperature (i.e. degrees Celsius + 273), B is the bandwidth of interest (in Hz) and R is the resistance (in ohms). For example, the thermal noise level in a bandwidth of 20 kHz from a 600 ohm resistor at 20°C equates to −125 dBu unweighted (approximately −130 dBu A-weighted). The noise level increases by 3 dB for each doubling in source resistance, so (for the same temperature and bandwidth) would be approximately −128 dBu from 300 ohm and −113 dBu from 10 kohm (both unweighted). Ideally, the equivalent input noise (EIN) of a microphone pre-amplifier would be less than the source noise level − or at least no higher than 1 or 2 dB above it. See also Microphone Noise Levels on the Microphones page. Thermal protection is most often encountered in power amplifiers, especially high-power types, to monitor the temperature of the output stage heatsink (and/or of the internal power supply). In such cases a front-panel indication is usually provided to warn the user when the thermal protection has operated − this is usually due to prolonged overload or to connection of an inappropriately low load impedance at the speaker output(s). An amplifier in this state is said to have 'thermalled', or 'thermalled out'. See also 'Protect' indicator and Dissipation. A very undesirable behaviour of an electrical circuit, particularly the output stage of a power amplifier, in which its operating temperature increases uncontrollably. This generally leads to destruction of multiple components within the circuit, unless protection features of the circuit operate rapidly enough to prevent the component temperatures and circuit currents exceeding safe operating values. It is an intrinsic behaviour of bipolar transistors that current flow through them tends to increase with increasing temperature. If, as is usually the case, this increased current flow leads to an increased operating temperature, then this in turn can lead to a further increase in current flow which increases the temperature even further. Therefore, circuits such as power amplifier output stages that use this type of transistor generally incorporate design features to prevent thermal runaway by compensating for the changes in transistor characteristics that occur as their temperature rises. Furthermore, thermal protection features may be provided to protect the circuit components and other connected equipment (such as speakers) from serious damage in the event of excessive operating temperatures being reached. Thermal runaway should never occur in any well-designed circuit, unless caused by a fault condition. An item of equipment such as a power amplifier whose thermal protection facility has operated due to an excessive rise in the internal temperature of the equipment (or of part of it, such as a heatsink), is said to have 'thermalled', or 'thermalled out'. For further detail see Thermal protection. The method of stating driver specifications that was devised by A. N. Thiele and R. Small, who did much of the foundational research into ported speaker enclosures. Describes (subjectively) musical sound or speech that is lacking in 'body' and 'depth', typically due to a lack of bass and/or lower mid-range frequencies. Compare Phat. An interval of musical pitch that corresponds to a frequency ratio close to 1.25 (in practice the value is closer to 1.26). So, two frequencies are said to be a third apart when one frequency is around 11⁄4 times (or, of course, 4⁄5 of) the other. For the musically minded, a third is so-named because this interval is reached at the 3rd note of a tonic musical scale. Between the lowest and highest of these 3 notes are 2 intervals, each of one tone. Since a tone is a ratio of the sixth root of 2, we can see that multiplying out these 2 intervals (i.e. 21/6 x 21/6) gives a resulting ratio close to a value of 1.25, as initially stated. See also Octave. Compare Fifth. A harmonic whose frequency is three times that of the fundamental. It is most commonly encountered as a type of distortion. Compare Second harmonic. Describes a graphic equaliser whose controls provide adjustment of frequency bands that are spaced a third of an octave apart. For further details see Graphic equaliser. A device which enables incompatible threads of microphone stands, microphone clips, booms, etc. to be screwed together. The three most usually encountered threads are 5⁄8″ 27 threads per inch (sometimes referred to as an American thread), 3⁄8″ Whitworth thread (sometimes referred to as a Euro thread), and (less often) 1⁄2″. A level which acts as a boundary between two different behaviours or responses. That is, something acts differently depending on whether the actual level is above or below this level. Most usually encountered as a control on dynamics processors. For example, on a compressor it determines the level above which compression occurs. See also Knee, Limiter, Noise gate, Expander and Squelch. See dB SPL on the Decibels page. A designation for an equipment output connector which provides an output signal that exactly duplicates the signal applied to a particular input connector of that equipment. In many cases this is achieved by means of a direct internal wiring connection between the two connectors, but in other cases signal buffering may be provided − see for example MIDI. The flared part of a horn, to which a compression driver is attached. A component that is designed to be attached to a PCB by passing its wire leads (or pins, in the case of an integrated circuit) though small holes in the PCB and by soldering those leads or pins to copper pads or tracks on the opposite side of the PCB to the component. Wire leads often then need to be trimmed to the correct length. Through-hole components are usually fitted to just one side of the PCB. Compare Surface-mounted component. The distance between a source of sound or light and its intended target, for effective operation. For speakers, the relative terms 'short throw' and 'long throw' are used to identify the intended application. For video projectors and for some types of lanterns, the throw is adjustable (within the limits necessary to maintain focus) − see the next definition. The throw of a video projector divided by the width of the projected image. Usually, for a particular projector or lens, the throw-to-width ratio is adjustable between two limits − outside of which the image cannot be brought into focus. Therefore a throw-to-width ratio range is usually quoted for such equipment. 'TIA' is an abbreviation for 'The Telecommunications Industry Association', an American organisation responsible for setting standards for the telecommunications industry in the USA. Some of its standards were developed in conjunction with the EIA (now superceded by the ECIA), hence the common standards designation 'TIA/EIA'. Their website is www.tiaonline.org (external site, opens in a new window or tab). See also the next definition and ANSI. It is not necessary (though helpful) for a consistent termination standard to be used throughout a system of interconnections, however it is very important that every cable having an RJ45 connector at both ends uses the same standard at both ends. See also QTP. Usually refers to a general purpose line of a particular type, e.g. balanced audio, video, UTP, etc., that runs between two equipment locations or rooms. Tie lines will generally terminate on a patch bay using an appropriate type of connector. An abbreviation for 'transient intermodulation'. The tonal qualities of a sound (as opposed to its level). This is determined by the relative degree to which various harmonics are present in the sound. Most often used in the comparative description of the sound produced by acoustic instruments. See also Formant. A difference in distance between a listening point and two or more speakers at different locations. A difference in the response time of speakers covering different frequency ranges, e.g. due to the design of the enclosures. A difference in the signal delay of the different frequency ranges through the crossover(s) (whether active or passive). Note that when the speakers to be aligned are not at the same location, the difference in the speakers' distance from a listening position will be different at different listening positions, and so the difference in the sound delay from them will vary from one listening postion to another. Therefore, no one value of time alignment correction delay can be optimal for all listening postions, and a compromise must be made to give the best sound for the largest proportion of the audience (or for the best-paying seats!). See also Propagation time, Speed of sound, Haas effect and Latency. A digital means of representing time (often elapsed time, rather than true clock time). See SMPTE, MIDI time control and Absolute time code. A method of specifying a person's daily dose of exposure to sound, taking into account the amount of time for which exposure to various different sound pressure levels (SPL) has occurred during the day. Such an exposure is quoted in terms of a constant dB SPL value that is deemed to be equivalent in terms of potential hearing damage. When sound levels and exposure durations are consistent and measurable, the time-weighted average may be calculated from these figures. Alternatively, it may be measured directly using a suitable dosimeter. Often abbreviated to 'TWA'. Compare Leq. An electrical conductor, typically of copper, that is manufactured with a very thin coating of tin, or a tin-based alloy, in order to prevent surface oxidation of the copper. In the case of stranded cores, each individual strand is separately tinned. The tinned design is used with some cable conductors and wires that are intended for soldering, as the absence of surface oxidation makes soldering easier and helps to avoid dry joints. Problems with oxidation are also reduced at spring-pressure terminals and binding posts. The sensation of a continuous sound in one or both ears, typically a buzzing sound, a steady note or a whistle, when no such sound exists in reality. Tinnitus may be permanent or temporary, typically occurring following an exposure to potentially damaging sound levels. It may only be evident when ambient sound levels are low. For further information see About Sound Levels on the Decibels page. See also Audiology, NIHL and SNHL. Describes a sound that is lacking in bass (or, less often, that has an excess of treble). See also Toppy. A single complete recording on a DVD (equivalent to a compact disc 'track'). Titles are sub-divided into chapters. The TN-C-S earthing arrangement is less than ideal for supplies used for PA equipment, especially when the same supply is also used for equipment that may produce mains-coupled interference. This is because currents drawn by the interfering equipment will impact on the earth potential provided by the incoming supply, due to the variations caused by the interfering equipment in the voltage drop across the supply's common Neutral and earth conductor. This in turn may cause interfering currents to flow in any conductors that provide a path between the incoming supply's earth and any points having an alternate means of earthing. The TN-C-S earthing arrangement is only suitable for use on supplies that have a very low risk of a break occurring in the incoming Neutral conductor (while the incoming Live conductor remains intact), because this would cause the Neutral conductor on the load side of the break to become live; the safety earth of the entire supplied installation would therefore also become live, along with everything connected to it. In order to reduce the risk of such an occurrence, the combined Neutral and safety earth conductor of the incoming supply is earthed at multiple locations along its route between the supply substation transformer and the supplied installation(s) − this is termed protective multiple earthing (PME). A TN-C-S earthing arrangement is therefore sometimes referred to as a PME arrangement. See also Bonding and BS 7909. Compare TN−S and TT. A designation that identifies a particular type of arrangement for providing the necessary earthing path for an electrical installation connected to the mains supply. In the TN-S arrangement (as recognised by BS 7671, the British wiring regulations), the main safety earth path for the installation is provided by the electricity supplier through a separate earth conductor (usually the metallic armouring of the incoming main supply cable), independent of the supply's incoming Neutral conductor. The connection between Neutral and safety earth is typically made at the supply substation transformer. See also BS 7909. Compare TN−C−S and TT. An abbreviation for 'table of contents', the area on an audio compact disc or mini-disc that indicates where on the disc the recorded tracks can be found. See also Finalise and PMA. The degree to which an actual value is permitted to deviate from a nominal value. It is usually expressed as a percentage. For example, a voltage may be specified as 20 volts ± 15%. This means that although the nominal value of the voltage is 20 volts, in practice it may be anywhere between 20 volts − 15% (i.e. 17 volts) and 20 volts + 15% (i.e. 23 volts). Sometimes different '−' and '+' tolerances are specified, e.g. 20 volts − 10% + 5%, which would indicate a possible value between 18 and 21 volts. Tolerance values of electronic components such as resistors and capacitors are usually either marked as part of the colour code or by using one of the following letters, according to the tolerance of the particular components concerned. It is useful to note that, when components having the same tolerance are interconnected in any series or parallel combination, the resultant combined value calculated from the individual nominal values has that same tolerance value. The relative degree to which various frequencies are subjectively perceived to be present in a sound. Or, the subjective effect that an item of equipment has on a sound by way of its reduced or emphasised handling of particular frequency ranges and/or by way of the presence or absence of particular resonances. In professional work, the term is most commonly used in respect of musical instruments and backline equipment − particularly amplifiers and speaker cabinets for electric guitar and bass. See also Tone control, Timbre, Colouration and Frequency response. A continuous repetitive-waveform test signal, usually of a constant known level and frequency, which is typically used to check the operation of equipment and interconnections or to align operating levels between different items of equipment. A tone is also used by some equipment to provide basic indications to other equipment with which it is designed to interoperate, such as to indicate its presence, its correct operation, its battery condition, etc., or to provide a reference frequency or phase for synchronisation purposes − see, for example, Pilot tone. It is often a sine wave. See also Line-up (2), Gain structure, Oscillator and SOL. An interval of musical pitch, six of which make up an interval of one octave. In terms of frequency, a tone increase in pitch represents a multiplication factor of a sixth root of 2 (approximately 1.122, i.e. an increase of 12.2%). A tone is the same interval as two semitones. The moving arm of a record deck, which supports the cartridge and exerts the appropriate vertical and lateral forces on the vinyl disc, via the stylus. A simple equaliser arrangement, usually giving control over just bass and treble frequencies. See also Baxandall. Relating to audio frequencies, see the next definition. Relating to speakers, see Tops. The treble end of the audio-frequency spectrum. See also Bottom end. The hollow insert fitted to the bottom of a speaker to enable the speaker to be placed on top of the pole of a speaker stand, so-named because of its overall shape. Usually sized to accept a pole of diameter 1.375 inches (approximately 35 mm), the most common size for speaker stand poles. Note that this differs from the 1.25 inch (approximately 32 mm) diameter most commonly used for lighting stands. Alternatively known as a pole cup. Describes a sound that has an excess of treble frequencies. See also Tinny. In modern PA systems this term usually refers to 'full range' speakers that alone have insufficient capability at bass frequencies and so are used in conjunction with bass bins or subs. Such tops are often placed on top of the bass bins, or are pole-mounted above them, in order to give improved coverage of the more directional higher frequencies − hence the use of this term for them. The term is usually used in the plural because at least two of these speakers are generally used, in order to provide stereo sound. In earlier systems using speaker stacks, the term has been used to refer to the uppermost speakers of the stack, that are provided to reproduce only the top end of the audio-frequency spectrum. See also Crossover frequency. Describes a type of mains transformer often used in the power supplies of power amplifiers. These transformers have a circular core, giving a 'doughnut-like' appearance, and are usually mounted by means of a single bolt through the centre. N.B. To avoid a short circuit turn on the transformer, it is essential that any metallic contact to the fixing bolt is made at one end only. 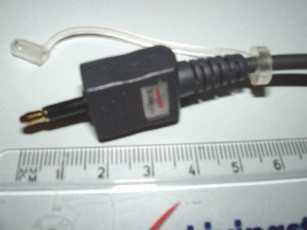 A type of connector for optical-fibre cables, typically used for optical S/PDIF interconnections. The name is an abbreviated form of 'Toshiba Link', and is a registered trademark of Toshiba. It is variously written as TOSLINK, TOS Link, TOS-Link, TOS-link, etc. An alternative optical interface standard is the 3.5 mm optical connector. A measure of the total harmonic content present in a signal, or that is introduced into a signal by a specific item of equipment. It is commonly used in PA work as an indication of the distortion performance of equipment. It is usually abbreviated to THD, and is expressed as a percentage value indicating the ratio of the RMS value of the overall harmonic content of the signal to the RMS value of its fundamental component. It should be made clear from the context, or explicitly, what is considered to be the fundamental component. Compare TDR (1). See also Intermodulation. An abbreviation for 'threads per inch'. See Thread adaptor. A section of a longer recording, able to be conveniently played in isolation (especially from a Compact Disc). In the case of an audio recording of music, a track is usually a single whole song (popular music) or a movement (classical music). The equivalent terms for a DVD are title and chapter. See also Mastering. A recording of a single voice or instrument, or a partial mix of such sources, made with the intention of later being combined with other tracks (in controlled proportions, and usually with the addition of effects and other processing) in order to create the final mix. Such tracks may be recorded simultaneously (e.g. from a band performing at a live event), one at a time, or in groups. Or, a single channel of a stereo or surround sound recording. Or, the physical magnetic impression of any such recording on a tape. See also Mixdown and Reel-to-reel. The resistive element of a potentiometer. The track is contacted by the wiper of the potentiometer at a point that is determined by the setting of its control knob. See also Dirty (2). An intentional conductive route on a printed circuit board, formed as a path of thin copper attached to the board. Alternatively known as a 'trace'. See PCB. The formation of an unwanted conductive path across a surface, betweeen two (or more) intentional conductors. A thankfully rare occurrence, usually caused or assisted by the presence of moisture or other surface contaminants around points where substantial voltages are present, such as at mains voltage connections. A slang abbreviation for 'transformer'. Any device which converts energy from one form to another. Microphones and speakers are both examples of transducers. However, note that the term may be used more specifically to refer to the internal part of such a device, in which the conversion of energy actually takes place. In the case of a microphone this would be the capsule, and in the case of a speaker it would be the driver. A device which uses electromagnetic coupling to change the voltage of an AC power source, to change the impedance of a signal, to convert unbalanced signals to balanced ones (or vice versa) and/or to provide galvanic isolation (usually as a safety measure or to prevent a connection between signal earths and so avoid earth loop problems). Sometimes abbreviated to 'trafo'. It consists of a coil of wire (called the primary winding) into which the supply or signal is fed, and one or more further winding(s) (called secondary windings, or secondaries) from which the output(s) are taken. One or more of the windings (primary or secondary) may be provided with one or more taps. In contrast with an autotransformer, a 'proper' transformer has no internal electrical connection between its windings. A 'power transformer' is usually used to reduce the mains voltage to the specific voltage required for powering an item of equipment, and to provide isolation from the mains supply (an important safety feature). Note that although the input and output voltages (and currents) of a transformer may be very different, its power input will always be just a little greater than its total power output. Power transformers are usually rated in VA. The impedance conversion property is used to enable the matching of the output of an item of equipment to an input which has a different impedance. For example, a passive DI box utilises the impedance conversion, balanced/unbalanced conversion and isolation properties. See also Balun, Toroidal, 100 volt line, Power supply and Balanced mains. Describes an item of equipment's input or output when the equipment uses an internal signal transformer to enable that input or output to provide the facility for balanced operation of its interconnection with other items of equipment. The term is usually used to emphasise that balanced operation is catered for by means of such a transformer rather than by means of electronic circuitry (compare Electronically balanced). For example, a passive DI box provides its balanced output in this way (and so avoids the need for a source of power to operate it). Note, however, that balanced operation of an interconnection is possible only when the equipment at both of its ends, and also the types of cable(s) and connectors used, are suitable for that type of operation. Transformer balancing is in general neither 'better' nor 'worse' than electronic balancing. However, each type does have its own advantages and limitations; the relevance and importance of these varies with each application. There are some instances in which one or the other type may be preferable (or even essential), but in most cases the quality of the equipment's input or output design is likely to have more effect on the results obtained than the type of balancing employed. It can provide a truly floating output or input, i.e. galvanic isolation from the equipment circuitry and from earth. A floating output maintains the same output level if one leg of the output is shorted to signal earth. Excellent common-mode rejection is possible, providing good immunity to earth loop problems. Good immunity to high levels of radio-frequency interference. Resilient to damage from large voltage transients, e.g. electrostatic discharges. Requires no source of supply power. May have a restricted frequency response. May have poor low-frequency linearity, causing sub-bass distortion. May be vulnerable to inductively coupled interference (e.g. from nearby mains transformers or from CRT computer displays), unless well magnetically screened. Relatively large size and weight. See also Quasi-floating and Balanced line. Compare Electronically balanced. Describes an item of equipment, or an input or output of an item of equipment, that operates without the use of an internal transformer. Most commonly used to describe a condenser microphone or a balanced input. For further information see Electronically balanced. Strictly, very short duration changes in the instantaneous value of a signal's voltage or of sound pressure, often large in magnitude. Their very rapid rate of change means that they contain high frequency components. However, the term is also used to refer to very short-lived peaks in signal level, usually occurring at high frequencies. Common sources of these are percussion instruments and electronic keyboards. See also Slew rate. Compare Spike. A type of distortion, caused by intermodulation that occurs only during the transients of a signal. Often abbreviated to 'TIM'. The degree to which equipment is able to handle transients. See also Slew rate. A 3-terminal semiconductor electronic component widely used within the amplification and signal processing circuits of equipment. Originally the functions of the transistor were provided by valves, but the very small size and high efficiency of the transistor has displaced valves in all general-purpose amplification and signal processing equipment, with the exception of some guitar amplifiers. There are very many different types of transistor, most of which can be classified as either bipolar or FET types. A specific type of FET commonly used in the output stage of power amplifiers is the MOSFET. See also Power transistor and Output transistor. A term usually used in reference to the unwanted passage of sound through a physical barrier such as a wall, partition, ceiling, floor, door or window. The alternative term 'passage of sound' is sometimes used. Typically, where such a barrier needs to provide reduced transmission of sound (such as in a studio), this will be taken into account during its design and/or construction. See also Acoustic wadding. Compare Propagation of sound. Describes a material (such as a windshield fabric) that has little significant attenuating effect on the passage of sound through it. (Of course, what is a 'significant' effect is a matter of opinion!) Or, to be more technically correct, describes a material that is able to pass sound. A subjective term sometimes applied to amplifiers and other equipment, to indicate that its output is apparently a faithful replica of its input. See also Fidelity. Originally, the mechanism of a physical recording or playback device, particularly a tape-based device, that supports and controls the motion of the media. However, the term may now also be applied to computer-based recording or playback applications, that use a hard-disk or memory as the storage media. Describes a speaker whose opposite sides are not parallel with each other − most commonly such speakers are wider at the front than at the rear. This allows multiple speakers to be readily positioned in an arc, so forming an array (or cluster) having a large dispersion angle (usually in the horizontal plane). Such speakers are notoriously difficult to accurately align directionally by walking the covered area and using a simple line-of-sight method, because their (non-parallel) sides do not become visible when the speaker is viewed from slightly off-axis locations, making their axis difficult to determine. Better results are often obtained by visually aligning from behind, or from above or below the speaker. The distance that the knob of a slider potentiometer (such as a fader) moves, when pushed between its minimum and maximum settings. Typical values of travel for faders are 45 mm, 60 mm and 100 mm; the band controls of graphic equalisers often have a much smaller travel such as 35 mm, 30 mm or 20 mm. A high audio frequency, typically above 8 kHz. A mixer will usually provide the facility to control the relative level of these frequencies separately for each channel, leaving lower frequency ranges essentially unaffected. This facility is usually provided by an equaliser having a shelving response and a cut-off frequency somewhere in the region of 8 to 15 kHz; such a control is often labelled 'HF'. Appropriate adjustment of the high frequencies is essential for good clarity. A lack of them will produce an 'indistinct' sound, whilst an excess will give a 'harsh' one. In a full-range speaker, the treble frequencies are handled by one or more drivers called tweeters − though when horn-loaded these are more commonly referred to as horns. See also Bass (1), Mid-range and Crossover. A deliberate repetitive variation in the level of a musical note, as an effect to improve the interest of the sound. Most commonly encountered in the context of keyboard instruments. Often confused with vibrato (for example, the effect produced by the tremolo bar of an electric guitar is actually vibrato, not tremolo). A 3-terminal electronic component commonly used for rapidly switching on and off loads that are powered from the mains supply. It is usually employed as the switching component within phase-angle control dimmers used for dimming stage lanterns that incorporate incandescent lamps. In the event of excess load currents (such as in the case of a short circuit, or sometimes when a lamp fails), the relevant triac in the dimmer unit may sometimes be damaged and require replacement. An unbalanced cable in which a single insulated central conductor is completely surrounded by a screen, which is surrounded by a layer of insulation and then a second screen which in turn is covered by an insulating sheath. It is so called because all three conductors (the central conductor and the two screens) all share the same axis. Normally used only for video signals in broadcast-quality applications. See also Coaxial cable and Telescoping shield. An alternative name for a gain control, favoured by some mixer manufacturers. Or, on some pre-amplifiers whose main gain control is a multi-position switch providing a stepped adjustment, an additional gain control that provides a finer adjustment (usually smoothly) over a limited range. In such cases, consult the equipment handbook for advice on the optimum setting of the Trim control to achieve the best signal-to-noise ratio. An additional channel level control sometimes provided on digital mixers. This control typically has an identical effect to the channel fader. Its function is to pre-set the effect obtained from a particular setting of the fader; the overall effect obtained is the combined effect of the two controls. For example, if the required relative level in the mix of a particular channel is obtained by a fader setting of −15 dB, then setting that channel's Trim control to −15 dB would allow that same level in the mix to be provided by a 0 dB setting on the fader, making manual restoration of that level (after temporary adjustment of the fader) more convenient. N.B. Do not use channel gain controls labelled 'Trim' (see Trim (1)) in that manner, as they have a different purpose. Usually refers to a potentiometer located inside an item of equipment, usually having no external means of access for adjustment − though occasionally the more general term 'trimmer' refers to an internally-adjustable capacitor or inductor. Trimmers are typically used to make fine adjustments to critical internal operating parameters of the circuitry. The correct initial adjustment is pre-set by the manufacturer of the equipment, so these internal controls are also referred to as 'presets'. To ensure continued safe and correct operation of the equipment, any subsequent adjustment must be made only by skilled persons, using suitable test equipment and an appropriate adjustment tool. See also Quiescent current. A slang term for a miniature circuit breaker (MCB). The automatic activation of a device or a facility, most usually as a result of a preset threshold being exceeded. The device or facility is then said to have 'tripped'. Use of this term usually implies that, following tripping, further operation of the affected equipment or system is either interrupted or otherwise modified until a manual (or sometimes automatic) resetting action occurs. The term is most commonly used in relation to protective devices such as miniature circuit breakers (MCBs), RCDs, AFDDs or thermal circuit breakers, where tripping occurs for safety reasons, or in relation to protective facilities such as a thermal protection facility of equipment such as a power amplifier, where tripping occurs in order to protect equipment from (further) damage. On occasion, tripping may occur unnecessarily − in relation to MCBs see Current surge and Inrush current. However, the possible reasons for any tripping should always be considered, and should always be investigated if it happens more than once or without a known safe cause. See also Circuit protection. The lowest level reached (or expected to be reached) by a sound or by a signal. Or, a reduction in response, especially in frequency response. Compare Peak. An abbreviation for 'tip, ring 1, ring 2 and sleeve', the names of the terminals of a 4-pole jack connector. The 3.5 mm version of this connector is most commonly used as an earphone and microphone connector on mobile devices such as mobile phones and tablets; other sizes are not usually encountered. The reason for this allocation is to avoid damage or other problems if a 3-pole (TRS) plug were inserted into a 4-pole socket, or vice versa. Because the sleeve is used as a sensitive Hot connection, 4-pole plugs usually have a plastic barrel rather than a metallic one in contact with the sleeve; this reduces the possibility of troublesome pick-up of hum or other interference when the barrel is touched. For further information, including details of some other applications of multi-pole 3.5 mm connectors, see Jack. An abbreviation for 'tip, ring and sleeve', the names of the terminals of a 3-pole jack connector. These are available in several sizes, including ¼″ (6.35 mm), 3.5 mm, 2.5 mm and B-types (see Jack), but the ¼″ type is most commonly encountered and is used for all the purposes listed below. The 3.5 mm and 2.5 mm types are usually used only for stereo connections on portable and mobile devices, while B-types are usually used only for balanced connections. The sleeve is always used for the signal earth connection. When used as a stereo connector, the tip is for the Left channel and the ring for the Right channel. When used as a balanced connector, the tip is for the 'hot' or '+' connection, and the ring for the 'cold' or '−' connection. When used as an insert connector (¼″ version only), the tip is usually for the send connection and the ring for the return connection. Very occasionally the abbreviation 'TSR' (for 'tip, sleeve and ring') is used instead of TRS. Compare TS and TRRS. A feature of an effect unit or (more usually) of a pedal. The purpose of this feature is to ensure complete disconnection of the unit's internal circuitry from the signal path when the unit is switched to bypass mode. This feature is of particular importance in the case of guitar and bass pedals that are connected directly (or via other pedals) to passive instruments, as it avoids possible inadvertant modification of the signal in bypass mode. Such a modification may be caused by the pedal's circuitry loading the relatively high impedance output of the instrument or previous pedal, possibly in a frequency-dependent manner. The absence of a true bypass facility means that, when the unit is switched to 'bypass', part of its internal circuit remains connected to the signal path through the unit. Therefore, although the intended function of the unit is disabled in this state, there may nevertheless be some noticeable modification of the signal passing through it which may be considered to be undesirable, e.g. a loss of highs or other changes in tone. A term used to indicate a 'genuine' diversity feature, rather than simply a provision of multiple antennae. See the 'Wired or Radio' section on the Microphones page. A term coined for a more accurate measurement method of peak signal level than the 'sampled peak' method commonly employed in digital audio systems, to enable better normalisation of levels. The 'true peak' method aims to take into account likely actual peaks occurring between the samples used to determine a 'sampled peak' figure, and therefore can potentially have a value slightly in excess of 0 dB FS. For this reason, a 'true peak' meter typically has a scale catering for values up to 3 dB TP − however it should be noted that the highest permissible level to avoid clipping is 0 dB TP. See also LUFS. A trademarked name for a specific type of PowerCon locking mains power connector manufactured by Neutrik, which are sometimes used on audio equipment. It looks similar to a Speakon connector, but will not inter-mate with it. It has a black and yellow body and its current rating is 16 amps. This type may be engaged or disengaged when live or under load. See also PowerCon. A means of containment and mechanical protection for cabling fixed within a building, typically of rectangular cross-section, made of steel or PVC and provided with a removable lid along its whole length to enable the lateral insertion and removal of cables. (This lid must therefore remain accessible after installation.) Due regard must be given to the maximum capacity of the size of trunking being used and to the possible increased heating effect obtained when many cables carrying a substantial current are enclosed together. Metallic trunking for mains cabling must be connected to safety earth. Compare Conduit. A long narrow metal structure, usually consisting of 3 or 4 parallel bars which are cross-linked by thinner strengthening members. Trusses are normally used horizontally and are typically used for the attachment of lanterns, other lighting fixtures and sometimes speakers. They may be flown on steel wires or fixed between vertical supports. They are manufactured in standard lengths which can be bolted together to give the required span (subject to the manufacturer's restrictions on maximum span and weight loading), but may also be custom-manufactured to a specified length. See also SWL. A rarely used abbreviation for 'tip and sleeve', the names of the terminals of a 2-pole jack connector. The sleeve is always used for the signal earth connection. Compare TRS. An American term for a valve. An American term for an amplifier that uses valves. A trademarked name for a type of connector used on some vintage microphones, e.g. some variants of the Sennheiser MD 421. It is similar in design to a DIN connector, but is usually provided with a threaded ring to enable locking. There are several types of these connectors, having differing numbers of pins, though the most common type has three pins. Typically professional balanced mics use the three pins to provide a balanced low impedance output, while some unbalanced mics use them to provide both low and high impedance outputs. In the context of PA systems, tuning a system relates to making adjustments to ensure optimum performance of that system in a particular venue − i.e. taking into account the dimensions, layout and acoustic properties of the space and the positioning and orientation of the speakers within it. Tuning may include setting delays and graphic equalisers, and balancing the contribution of the various speakers in order to obtain satisfactory coverage of the audience area at an acceptable sound quality. It may be carried out entirely by use of listening tests, or may include the use of formal measurement and analysis methods such as STI or MLSSA. Usually refers to the procedures carried out to ensure that the musical notes produced by musical instruments are produced at the correct pitch (except of course where intentional deviations from correct pitch are made). These procedures are carried out as a minimum before the start of a musical event, and additionally thereafter as required. Tuning is typically carried out by reference to a standard pitch, usually concert pitch. However, the term may also be used to refer to the degree to which instruments or sung vocals are correctly or incorrectly pitched. See also Cent and Middle C.
An American term for a gender changer. An alternative name for a crossover frequency. A device for playing vinyl records. Also called a 'record deck'. An abbreviation for 'time-weighted average'. Slang for 'to make a relatively small change or adjustment', especially to the setting of a control. A high-frequency driver − a driver which is designed specifically to handle treble frequencies, also called an 'HF driver'. Such drivers are typically used in full range speakers. The HF drivers of professional PA speakers are usually horn-loaded, and are referred to as horns. See also Throat, Compression driver, Bullet, Ferrofluid, Crossover and Bi-amping. Compare Woofer. Theatre slang for a dancer. A pair of insulated conductors that are twisted around each other throughout their length. Typically, the conductors are part of a cable and are used to carry balanced signals. The twisting reduces differential inductive coupling into the pair from other nearby conductors, and also from the pair into other nearby conductors. Capacitive coupling effects may also be reduced, especially when the pair are unscreened. For further information see Pair. See also UTP, STP and Lay length. An abbreviation for 'transmission', or an identification of the transmit (or 'sending') direction of communication. Compare Rx. This page last updated 04-Mar-2019.